I say box brownies because I did a terrible thing. I used a brownie mix, and I did not actually make the brownies for myself. Well, sure, I had mixed up the mix itself a month or so before, so it was all actually homemade, but it is still not the done thing. Then, when I had whipped up my homemade mix, I then did an even more terrible thing. I had actually added some mix ins, and made my own brownie mix taste even better. So now, dear friends, that you know the awful things I have done, I trust you will not thrust my out of your comraderie and thrust me into the dread world of unfollowed bloggers? Seriously, though, these brownies make me feel like I should be asking someone for forgiveness. I think I should feel bad for eating them, as they are really just that good. Really! I got the inspiration for a basic brownie recipe at The Gluten Free Goddess, and I just went a little crazy with mix ins and other bits and pieces from there. 1/4 cup large chocolate chunks. *You can buy chocolate chunks as-is, or just smash up a solid bar or block of chocolate with a hammer. Obviously, that is the fun route, but it won`t be as perfect looking. I don`t recommend it for seriously OCD people, just because we want to avoid human explosions. Store in a large and air-tight container in the pantry. I like Bell Jars, especially with a cute fabric cover. The mixture of almond flour, sorghum flour, and baking soda is good as a general homemade dry mix. Preheat the oven to 350ºF. Line an 8×8-inch square baking pan with parchment paper. Stir in the nuts by hand and spread the batter into the prepared baking pan. Even out the batter with a silicone spatula. Stud the top with some chocolate chunks and press in slightly. I love brownies! What is your favorite dessert, or recipe? Next postWhy Do I Blog? Looks so good! 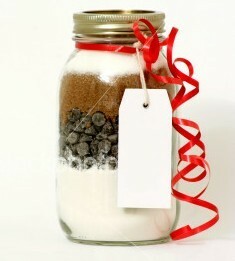 I love the idea of making the mix first to store for future use. Makes a great gift idea too. I just decanted a ten pound bag of mix I had bought in bulk (I don`t always feel like mixing it up myself, and this version was on sale!) and I plan to use it all the time in the future. It really is nice to store a few basic mixes, like pancake, yellow cake, and bread, and then be creative and make new things with less time and no nasty preservatives or overhead pricing.